Yes, I figured that some might not be too happy about having their windows or front doors online and recorded, so I added those. Apparently, but I find it surprising myself, in particular such a long line. I'm not sure what the physical explanation is. But I have no other explanation, unless someone in my neighbourhood is firing with tracer ammo. If you search for cosmic ray artifact Google will give you similar pictures. I think cosmic ray (or muon decay product of one) is by far the most likely explanation, it's just that as you say the extreme track length is surprising. It makes a lot more sense now after realizing the sensor is oriented roughly vertically, unlike in most terrestrial-based CCD astronomy. Then you expect fewer events, but longer tracks on average, with ones as long as that rare, but inevitable given enough time. For the first time in my life I got to see some Zodiacal light. Milky Way disappearing behind the city lights. Very nice! That first shot is so good it could be marketable. I've also seen the zodiacal light only once, while traveling overnight from La Paz, Bolivia to Cusco, Peru. It was noticeably triangular, stretching perhaps 30 degrees above the horizon. It's amazing how something so faint can seem so bright from a truly dark sky. Absolutely, they're phenomenal shots. The cluster of trees being cast in silhouette by it makes for a great composition as well. I'm glad you got to see it -- zodiacal light is a rare thing for people to see in this day and age. 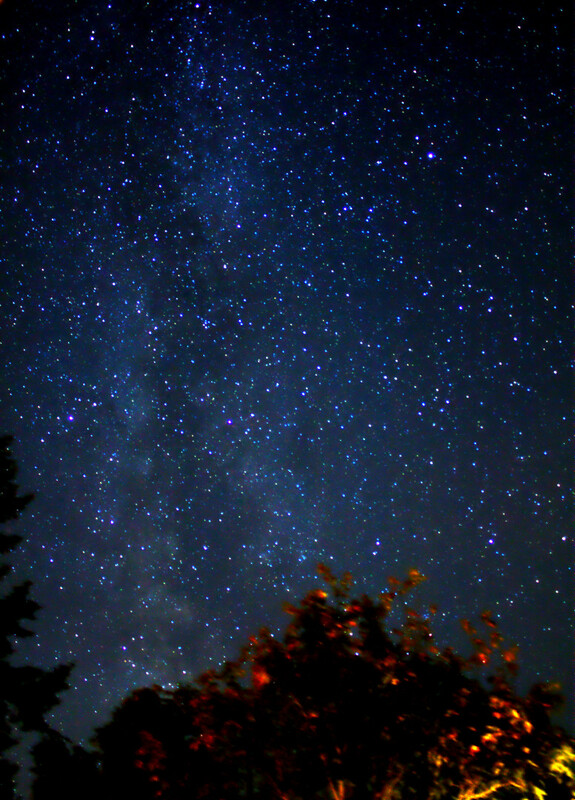 Unrelated: tonight I tried applying the stacking technique for another Milky Way shot, using six 20s exposures, or two minutes of data. This is probably about as good as I can get from this location with current equipment. 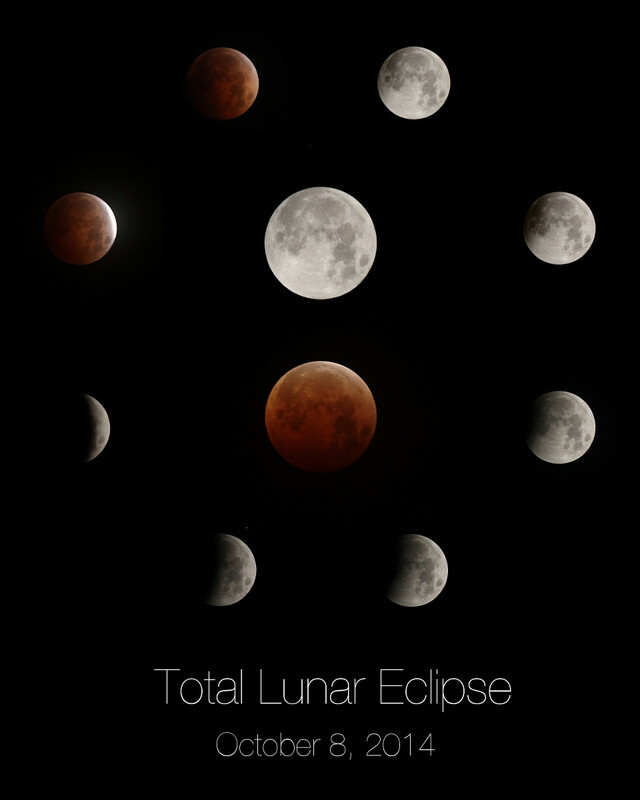 Captures of last night's eclipse. Had to drive ~300 miles to Eastern Washington to avoid the clouds for this. Call me crazy, but I'll travel even for the lunars. They're magical. Yep, you'll be well placed for that one, and it has similar magnitude. You also get a strongly central eclipse in July, 2018. I've never seen one of those. Won't get a good one like that in North America until 2029! The next eclipse on April 4th will be interesting in a different way -- magnitude 1.001 with totality lasting only 5 minutes. Pretty short! I'm currently pondering whether I shall bother at all to photograph the totality of the [url=http://en.wikipedia.org/wiki/Solar_eclipse_of_March_20,_2015]2015-03-20[/url] [EDIT: urls don't embed properly if they contain a comma] solar eclipse or simply enjoy the show. It will last 2 minutes 27 seconds. Less rush with lunar eclipses, though. That's always a tough call to make, but I think I would lean towards just enjoying the show. I've heard many stories of people who photograph totality and regret it later, because during the rush to compensate for rapidly changing light conditions, they see almost none of the event with their eyes! Especially true for the shorter eclipses -- 147 seconds goes by fast. The other thing about photographing totality is that there is no single exposure that can pick out the range of detail (especially in the corona) that the eye can see. It's way too much dynamic range. The same thing happens with lunar eclipses as well, when there's a crescent remaining. 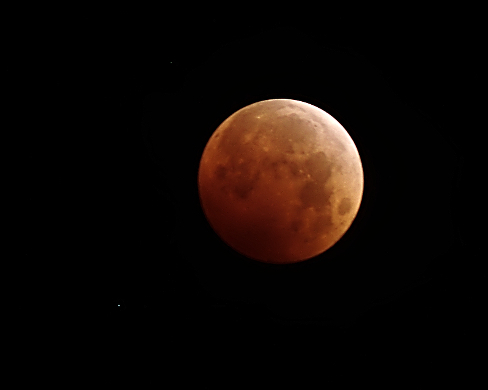 The eye at that point can see both the penumbral detail and the red glow of the umbral shadow, but a camera can only expose for one or the other. Whatever you choose to do, I hope you get to see it! I'm waiting on 2017. I just realized after looking at APOD that Uranus was right next to the moon during the eclipse. Sure enough, it's in my shots as a bright blue/green dot, below and left. I'd thought it was just a star! I wonder if Earth was transiting the Sun from Uranus' view? Question: It has been such a long time since I saw a lunar eclipse (august 2008 being the most recent), how dark is the Moon during an eclipse? What is the Moon's apparent magnitude? Pretty dark, but not black. I'm not sure what the effective magnitude would be, but it gets dark enough that the Milky Way, which is otherwise totally obliterated by the moonlight, becomes visible. The change an ambient light during the eclipse is one of the most striking things about it if you can see it from a dark site away from the cities. The exact brightness and color can vary from one eclipse to another, as it depends on how deep the moon is in Earth's shadow, and the extent of cloud cover and volcanic aerosols in Earth's atmosphere. With a typical "clear" atmosphere, the core of the shadow is a dark red, becoming brighter and more orange/yellow toward the edges. The picture at the ~11o'clock position is a pretty good representation of how the eye sees it. how dark is the Moon during an eclipse? What is the Moon's apparent magnitude? It depends on many factors, including the Moon's distance, how deeply into eclipse it goes, and atmospheric conditions on Earth (which affect the amount and color of light that the Moon receives). No, at least not according to Stellarium, but it did come within ~1 minute of arc of the solar disk.